One of the most overlooked aspects of lethal combat is the aftermath: what if you or your battle buddy is gravely injured and needs medical attention before the EMTs arrive? 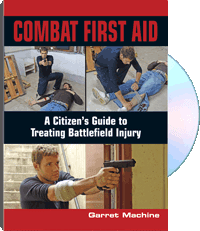 In this video, former Israeli Special Forces medic Garret Machine teaches you the lifesaving skills he learned on some of the world's most dangerous battlefields. He begins by putting together a basic first aid kit comprised of items anyone can purchase, and from there goes into how each one is used, from personal bandages to tourniquets to airway devices and more. Concentrating on a step-by-step schematic of assessment and treatment of the most severe injuries first, Machine prepares you for the kinds of medical contingencies you're most likely to encounter as a result of damage in the field: stopping arterial bleeding, providing rescue breathing, and prepping your patient for transport. He keeps the focus on tactical situations rather than the perfection of an antiseptic hospital so that if the worst should happen, wherever it is, you'll be prepared and ready. For information purposes only. Garret Machine served as a warrior in the Duvdevan Unit, an elite special forces unit in the Israeli Defense Forces. In addition to participating in the unit's day-to-day combat operations, he was also a field medic and instructor who taught first aid and firearms tactics. He is now in the U.S., bringing his knowledge of the field to you firsthand.